Todd Sinnott fired opening rounds of 68-65 to be a 11-under-par and six ahead of his nearest rivals Jarrod Freeman and Lucas Herbert at the Riversdale Cup in Melbourne. Sinnott’s 7-under-par second round included an ace on the par 3 third hole, coupled with six birdies. His only blemish, a bogey on the short par-4 16th. “I got a nice little hole in one on the third and that started me off for the round,” said Sinnott. In his last seven events, Sinnott has not finished outside the top-10 with his last victory back in 2012 at the Portsea Open Amateur. 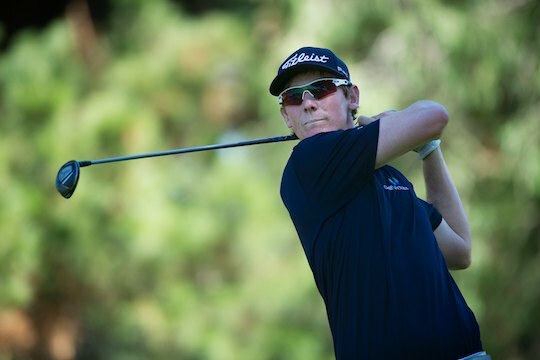 A finalist at the Victorian Amateur earlier in the year, coupled with a runner-up finish at the Australian Master of the Amateurs in January has been the reward for the fine run of form Sinnott has been displaying. Sinnott was a little unlucky at the Australian Amateur in Adelaide when he went down to the wire in his semi-final match against Curtis Luck. Luck had held a two hole advantage through 14 holes before Sinnott won back-to-back holes on 15 and 16 to square the ledger but to then lose on the 18th after Luck executed a wonderful up-and-down from the green side bunker. Brad Hayward, Taylor MacDonald, Hayden Beard, Zach Mullins, Cameron Davis and Thomas Power-Horan round out the top-10 following the second round. Ryan Ruffels, Jake Mcleod and Jarryd Felton are at even-par.